Cheltenham’s first Chinese restaurant, Ah Chow, was opened by Soo Yow in 1958. The restaurant was initially located in half the current building. They served Chinese and English food and quickly built up a regular clientele. Soo Yow moved to Cheltenham with his family from Birkenhead in 1949. He also set up the first Chinese laundry which was in Winchcombe Street. My grandfather Soo Yow came to Cheltenham in 1949 with my grandmother and their six children. He opened the first Chinese laundry in Cheltenham; this was in Winchcombe Street, where the Golden Mountain Restaurant is today. In 1958 he opened the first Chinese restaurant, Ah Chow on the same site as The Mayflower but only two thirds of the current building. When it became the Mayflower in the 1980s, the new owners bought the building next door and expanded the restaurant. My grandfather worked really hard, he did up to 23 hour days, I do have very young childhood memories of crates of Lucozade – the 1950s equivalent of Red Bull – at home which kept him going. Regular customers came to the restaurant every week, many sat at the same table and ordered the same food; it was seen as a treat to go out for a Chinese meal at that time. It quickly became very popular, I think because it was new and also because they offered English and Chinese meals. There were queues outside; it was something exciting and delicious. It was a good way of getting to know the locals and my grandfather made lots of friends including the Cheltenham Mayor and MP Charles Irving. My mother worked at Ah Chow and my father was manager until my grandfather retired and sold the business on. My grandfather, who had served with the French Chinese Labour Corps in France during WW1 (1916-1920), spent 29 years in Birkenhead before coming to Cheltenham in 1949. He opened the first Chinese laundry in Birkenhead. It’s only recently that I’ve found out what my grandfather went through during WW1 and it’s helped me to make sense of my life by understanding more about my family’s past. It would have been very difficult for the owners of Ah Chow in 1958. They would have had to make all their own ingredients from scratch as you wouldn’t have been able to get hold of items such as bean sprouts for instance. So you would have to grow things too, such as mung beans. Nowadays, there are so many suppliers and manufacturers of the raw ingredients that go into all the Chinese dishes; they do the production part for us. Making pancakes for Crispy Duck takes a lot of work. Making Chinese food is time consuming and very technical. It is hard running a Chinese restaurant now, but then even more so! Parents had to make a lot of sacrifices. It was not uncommon for very young children to be carried on the backs of their mothers while they were cooking; the hours are so long and physically demanding. In 1999 I opened Celestial Dragon on Winchcombe Street. I suppose you could describe it as a cross between a museum and an arts & crafts shop. I sold all kinds of Chinese cultural curiosities, such as figurines, Kung Fu costumes, and martial arts paraphernalia. But my most popular items were Chinese DVDs which I became well known for selling. I could source almost any Chinese films direct from China and at that time it was very hard to find Chinese films in this country. Actually, I had no idea that many films had cult followings over here. Many local people know me through Celestial Dragon and that’s also when people started calling me ‘Aunty Donna’. At some point I realised that my customers were learning Cantonese by watching the films from my shop. They started greeting me in Cantonese. I was amazed. My dream was always to open a restaurant that would introduce English people to our traditional Hong Kongese dishes; the kind of food that isn’t on offer in most Chinese restaurants over here. And so it was that we opened Dragon Chef down the lower end of the High Street before changing its name to Hei Kitchen in 2014 (Hei means happiness). We serve good quality comfort food, which you could describe as both home-style cooking but also a street-style food. For some of our Chinese customers our food brings back memories of childhood and of food they might have eaten at home in China. In fact many items on our menu you can’t find anywhere in the UK, not even in London’s Chinatown! 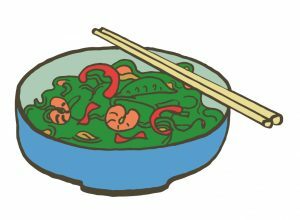 Traditional, old-fashioned recipes which our parents used to treat us to at festivals or on special occasions, like Mum’s Soup, Congee (a comforting porridge dish) and Stir Fried Morning Glory (an unusual Chinese vegetable that you can’t find in the supermarkets). I am often pleasantly surprised by my English customers when they have learnt the names of the dishes and pronounce them perfectly. Top Tip – ask for the Chinese menu next time you visit!